A challenging platformer that takes you back to the good old days Before it became WiiWare, Cave Story was just freeware. Single-handedly developed over half a decade by game designer Daisuke Amaya and unleashed onto the Internet in 2004, the game drew loads of buzz and evolved into a genuine cult hit over the years, spawning tribute sites and fan translations. So porting it over to the Wii seemed like the natural step, and it’s the natural system for a game like Cave Story. 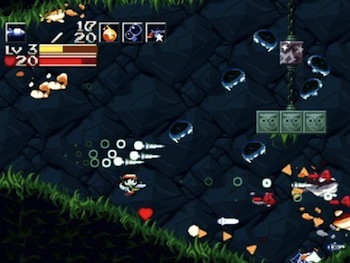 It’s been compared to Metroid, Castlevania and Mega Man, but Cave Story takes ingredients from all three. You’ll be jumping and propelling through an assortment of unique stages, blasting away baddies and accumulating power-up crystals to charge up a variety of unique weapons that range from a machine gun to a bubble shooter. Innovative enemies and instant-death spike pits create some frustratingly hard challenges, especially since save points tend to be sporadic and, during some parts, nonexistent. Throw that unforgiving difficulty into the pot with Cave Story’s old-school aesthetics and you get a tasty stew that resembles a NES game, just more polished. Like Cave Story’s amnesiac protagonist, you begin the game knowing nothing; the plot is gradually fleshed out by your conversations and discoveries on the island. Unearthing this story is a lot of fun, and although it would have been nice to see more of the main character’s past, Cave Story’s subtle narrative is a refreshing change of pace in an era where game plots like to hammer you with ostentatious messages about love and sacrifice. But Cave Story has its flaws. Some of the musical effects can be grating, like the shrill cling that power-ups make when they bounce, the endless pew pew of laser weapons, and the unnecessary text scrolling noise—in fact, when you Google “text scrolling noise,” the first few results are complaints about Cave Story. Most of the game’s secrets fall into the near-impossible-to-find-without-a-walkthrough category, including the painstaking series of oddly specific actions needed in order to unveil the best ending. And sometimes boss fights feel more like exercises in trial-and-error than strategic battles, although overcoming them is always satisfying. No matter how good it is, it's hard to justify spending money on a game that's been available on the PC for free for almost six years. But the sideways Wiimote makes the perfect controller, the variety of weapons and secrets offer plenty of replay value, and at only 1200 Nintendo Points ($12) you get a lot of gameplay for your money. And of course there’s the warm, fuzzy feeling that comes with supporting indie developers such as Studio Pixel. You want to feel warm and fuzzy, don’t you?